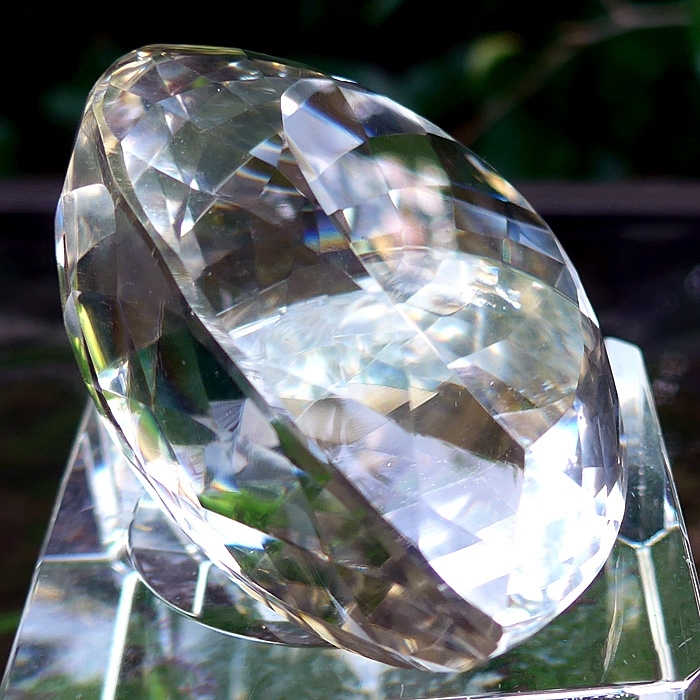 Dimensions (HxWxD): 2.1" x 1.75" x 1.25"
This water clear highly faceted 397 carat Trillion-cut Brazilian quartz gemstone is 2.1 inches in length and 1.25 inches deep and would be a beautiful addition to your home altar, night table, computer workstation or treatment room. This beautiful gemstone also comes complete with its own drawstring pouch. The clarity of this gemstone is imparted to the bearer during meditation or when placed upon the body of a person during energy treatments. 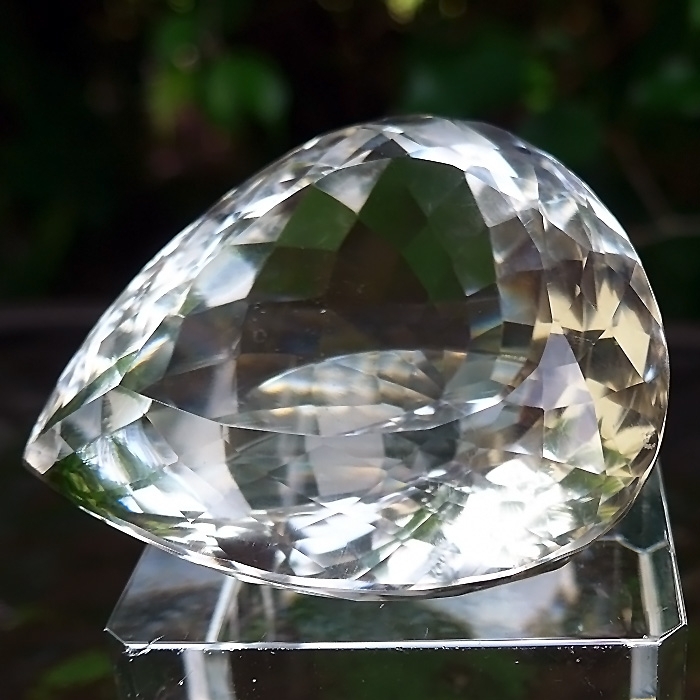 The healer could also place this powerful gemstone on an altar or table nearby the recipient during a treatment. This gemstone is the perfect size to hold in the hand during meditation, and can also be placed upon the body of a person receiving Reiki or other healing treatments. In meditation with this amazingly powerful gemstone, I felt my etheric body energized, my aura strengthened, and chakras opening from root to crown. This clear quartz works to quiet the mind and open consciousness to Higher Mind and Higher Wisdom. 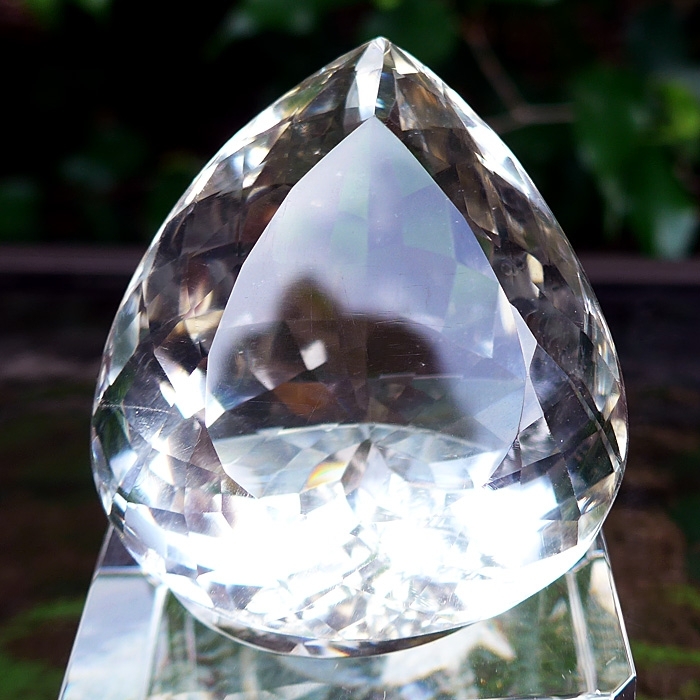 In meditation, I noticed that this water clear quartz crystal gemstone is a fantastic tool for attuning the body, mind and aura to the highest vibrational levels of existence, to the total clarity of the Higher mental levels where angels, devas, and deities reside and the templates of creation are formed and maintained. This powerful crystal also cleanses, stimulates and energizes the entire chakra system, enhancing personal power and grounding the bearer in a very gentle and relaxing way. I have found that meditating with highly faceted quartz gemstones and using them in Reiki treatments can yield extremely powerful results. In my experience, there is a sharper focus to the energetic transmission of a faceted gemstone crystal and the clarity of the energy being transmitted is enhanced. We are proud to offer our customers only those crystal gemstones that come from cutters whose work is demonstrably of the highest quality. We personally "test-drive" and examine them all energetically prior to accepting them for our inventory. Note: weight above is shipping weight. 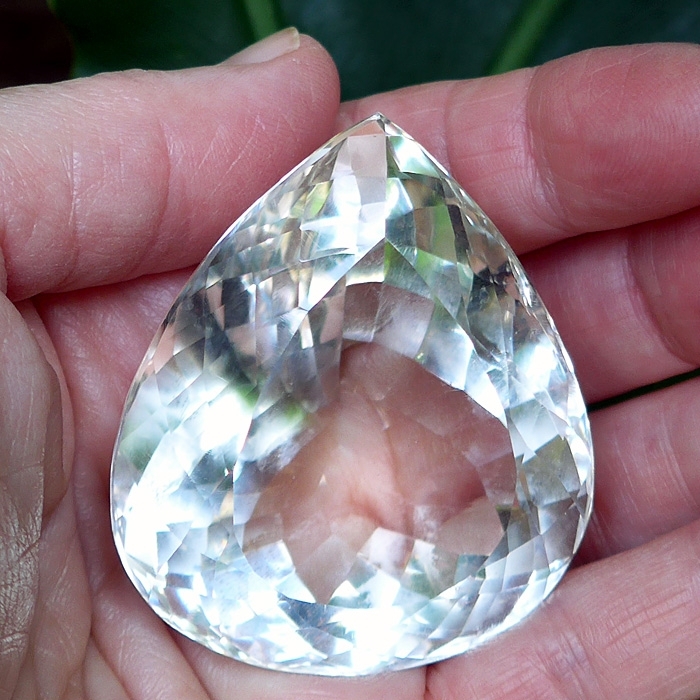 Net weight is approximately 2.8 ounces, 79 grams or 397 carats.